This article is about the United States "Light (duty) truck" category. For Canadian, European, Australian and New Zealand light trucks, see Light commercial vehicle. For other uses, see Truck. For broader coverage of this topic, see Truck classification. Light truck or light-duty truck is a US classification for trucks or truck-based vehicles with a gross vehicle weight up to 8,500 pounds (3,860 kg) and a payload capacity up to 4,000 pounds (1,815 kg). Similar goods vehicle classes in the European Union, Canada, Australia, and New Zealand are termed light commercial vehicles and are limited to a gross vehicle weight of up to 3,500 kg (7,720 pounds). Federal regulations define a light-duty truck to be any motor vehicle having a gross vehicle weight rating (curb weight plus payload) of no more than 8,500 pounds (3,860 kg) which is “(1) Designed primarily for purposes of transportation of property or is a derivation of such a vehicle, or (2) Designed primarily for transportation of persons and has a capacity of more than 12 persons, or (3) Available with special features enabling off-street or off-highway operation and use.” Light trucks includes vans, pickups, and sport utility vehicles. 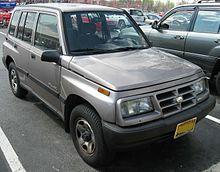 The United States government uses light truck as a vehicle class in regulating fuel economy through the Corporate Average Fuel Economy (CAFE) standard. The class includes vans, minivans, sport utility vehicles, and pickup trucks. Light trucks have lower fuel economy standards than cars, under the premise that these vehicles are used for utilitarian purposes rather than personal transportation. Since light trucks sold in the United States are increasingly being used for personal use, some have advocated applying higher economy standards to light trucks that are not used for utilitarian purposes. Production of light trucks in the United States are protected by the Chicken Tax, a 25% tariff on imported light trucks. This page was last edited on 18 February 2019, at 19:59 (UTC).